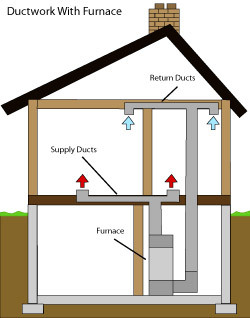 Understanding Supply and Return Air Ducts and How They Keep You Comfy! The number and location of supply and return air ducts in your home is very important to the comfort level in your home. Many homeowners do not realize that an imbalance of their supply and return ducts could cause severe pressure differences in each room of their home. Dr. Energy Saver knows how to fix this problem. Heat travels in three ways: conduction, convection, and radiation. It is insulation's job to prevent the movement of heat from one area to another. Find out how insulation works and how it stops heat from moving through your home-- where you don't want it to go!